Everybody loves pizza and everybody knows pizza is divine and perfect. And while many agree that pizza does not need a side dish, there are few social conventions where a few extra sides might go a long way in complementing your pizza. Ranging from a healthy salad to a hot, fiery bowl of chicken wings, certain dishes remain as loyal sidekicks for a slice of pizza. Having said that, not all sides are eligible for the role. These dishes have to serve as a true companion and make sure that they don’t ruin the saucy, doughy, and cheesy pie. The feat of finding the best side to your pizza is something that balances the flavors of the pizza. Here are some of the best sides that are truly the quintessential dishes when eaten along with a pizza. A healthy way to support your pizza is Chef’s Salad. Owing to its popularity, Chef’s Salad has all the essential qualities to balance your palate with wholesome flavors. 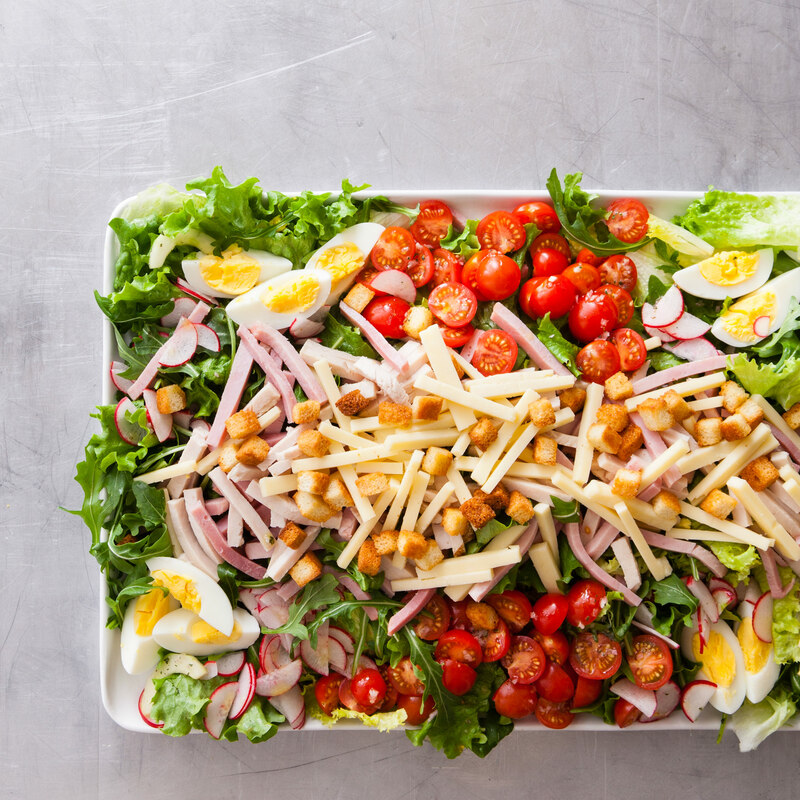 Made with ingredients like hard-boiled eggs, varieties of meat, tomatoes, cucumbers, and cheese — placed on a bed of tossed lettuce or other leafy vegetables — Chef’s salad is more than a healthy snack. As most of you know, garlic bread makes up for a terrific appetizer. Topped with garlic, butter, and herbs, this roll of bread is the best way to kickstart your tastebuds. Garlic Bread is pretty common in restaurants and are mostly paired with pasta and pizza, simply because it’s a bread that pairs well with cheese. Anything with cheese on it is good. Anything fried and covered with molten cheese is the best. Cheese Fries or Cheese Chips are a great snack or side to have along with pizza, since they do not undermine the taste of a hot pie. Colorful and healthy, Caprese Skewers are the best way to start on your courses. The acidic rush of vinegar, the tanginess of tomatoes, the crunchiness of basil leaves smoothed over by olive oil, make Caprese Skewers an exciting appetizer. For all those seafood lovers, Calamari is the perfect side for your pizza. 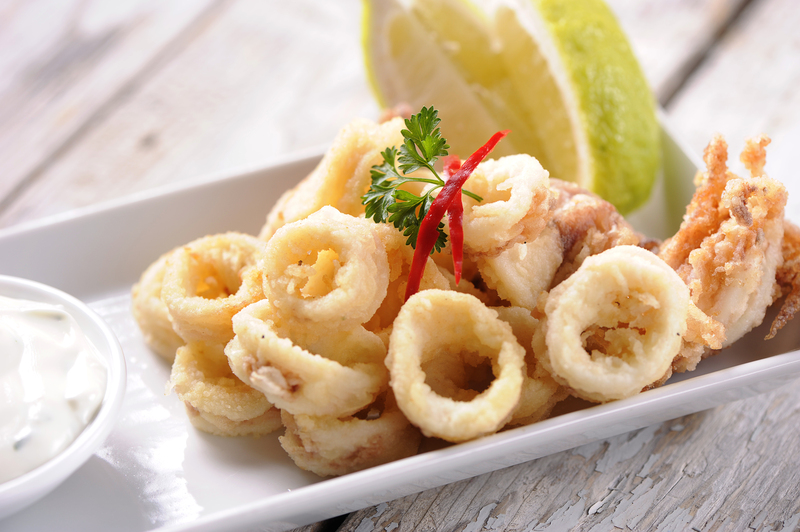 While Calamari is high in protein, the tender squid meat when breaded and fried, makes for a delicious sidekick. Anything that is deeply fried is always, without a doubt, tasty! Potato fries have always been our favorite. But spring onions when fried, topped with scentful herbs and served with a dipping sauce, makes it even more interesting and a great snack to tag along with a pizza. If you’re ever contemplating what to order for starters (and what pizza to order), we’ve got you sorted. Just fire up the Swiggy app and order in! Previous articleHere Are 5 Types Of Idlis That You Should Know About! Next articleWe Found Love: Here Are 8 Swiggy Users Across India Who Are In A Committed Relationship With These 8 Dishes!